The ability to use double slabs in creative mode is infinitely useful. It doubles building speed when using slabs, and the normally unobtainable slab with a damage value of 6 is a block used regularly by most advanced builders I've seen. In the snapshot, this functionality has been removed. Placing a double brick slab results in a double stone slab, and double birch slab results in oak. This is incredibly annoying to say the least. Come to think of it, blocks like Huge Mushroom that have always ignored damage value are just as annoying. I'm sure I'm not the only one who would like to build their own giant mushrooms without having to use pistons or MCEdit. Please remedy this. MC-2771 The pick doesn't work on double half slabs properly. MC-3299 Double-slabs obtained from commands place as double-stone slabs regardless of type. MC-3621 Pick Blocking on Double Cobblestone slab, when placed has stone double slab texture. MC-4178 When using pickblock on a double slab of any kind other than stone, the block will be placed as a double stone slab. 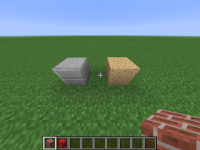 MC-4228 When placing a picked block "Double Nether Slab"